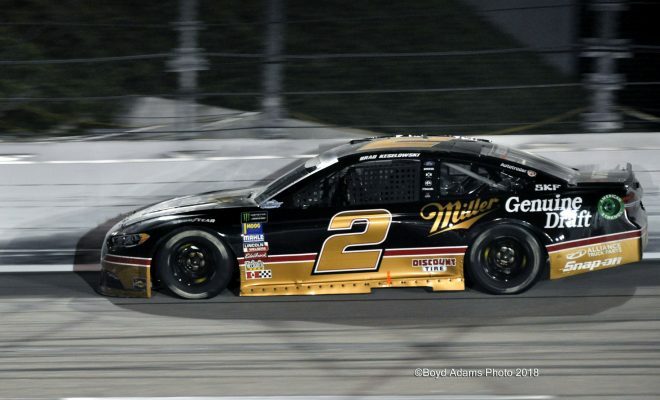 DARLINGTON, S.C. — Brad Keselowski won the Bojangles Southern 500 for his first Monster Energy NASCAR Cup Series win of the season. He and Joey Logano gave Team Penske a one-two finish. Keselowski made the pass for the lead on pit road under the final caution. “I give a lot of credit to my pit crew,” said Keslowski. 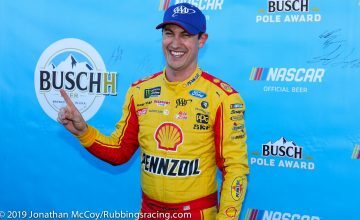 His victory was his first MENCS win at Darlington Raceway and the first for Team Penske since 1975. 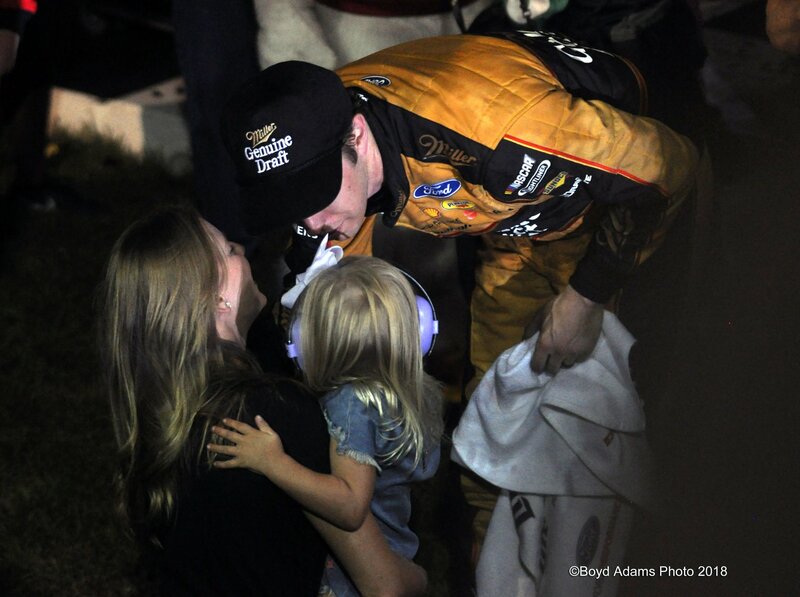 Brad Keselowski celebrates with his wife and daughter in victory lane. Photo by Boyd Adams. The 69th rendition of the Southern 500 began with Denny Hamlin leading the field of 40 cars to the green flag. He led for 11 laps before Larson took control of the race. More than halfway through the first stint, Alex Bowman pitted for a flat tire. Green flag pit stops began 17-laps later, when Darrell Wallace Jr. came to pit road. Once the field cycled through Larson had a 3.7 lead over Truex. He quickly extended his lead to over four seconds. Erik Jones, who had driven from seventh to second in the first run fell back one position to third during the pit stops because he was slow entering pit road. Jimmie Johnson returned to pit road because he was experiencing a vibration, but on entry to pit road he made a commitment line violation. He was forced to serve a pass through penalty for the error. When Johnson returned to the race track he was three laps down. His crew chief, Chad Knaus radioed, “We’ve got to catch the 42 if we want a shot at doing anything today.” Minutes later Johnson passed the leader, making him just two laps down. 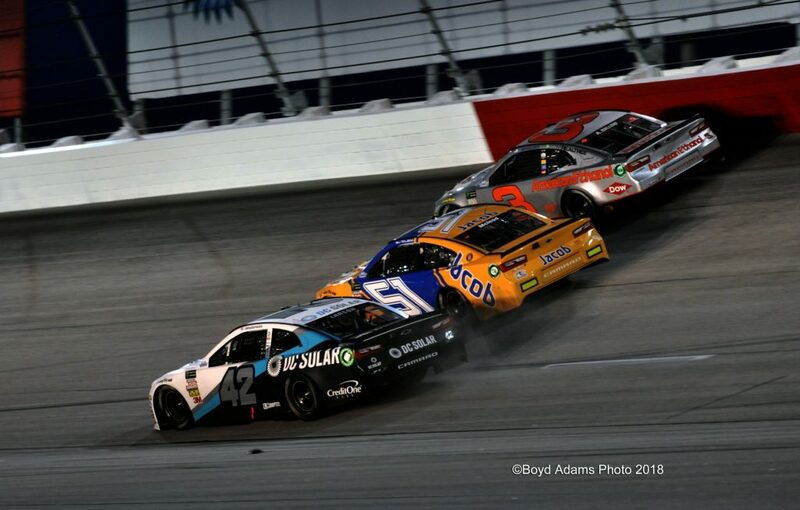 Over the final 15 laps of the first stage, Austin Dillon battled to stay on the lead lap. After originally going a lap down, he went back by the leader half a dozen laps later. Desperate to stay on the lead lap Dillon nudged Ricky Stenhouse Jr.’s rear bumper in turns one and two. Going through three and four he held a low line and on exit he tried to pull in front of Larson, the leader — he wasn’t quite clear. Dillon’s right-rear quarter panel dinged Larson’s left-front bumper. Larson suffered light damage but as a whole his car was unaffected. 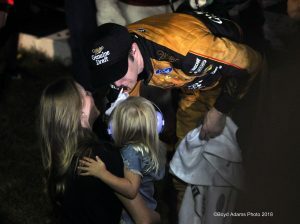 A lap later Larson won the stage, his second stage win of the season and Dillon maintained his position on the lead lap. Chris Buescher was the first car a lap down; making him lucky dog and granting him a pass back onto the lead lap. Austin Dillon, No. 3 battles with Kyle Larson, No. 42 to stay on the lead lap as both of them go by the lapped No. 51 car of BJ McLeod. Photo by Boyd Adams. Upon the stage break caution, the first of the race, everyone came to pit road. During the pit stops an uncontrolled tire penalty was assessed to the Jones’ No. 20 team. He started the second stage at the tail end of the field. On lap-129 Joey Gase wrecked out of the race. Kyle Busch hooked him in his left-rear. Over the radio, Gase’s team speculated they were dumped because they were in Busch’s way. The leaders pitted under the caution and Truex’ pit crew were fast enough to get him past Larson, into the lead. When the race restarted on lap-133 Truex and Harvick became the top two contenders. Larson quickly fell 1.5 seconds behind the leader. Harvick never let Truex escape his sights. After about 10-laps Harvick made a move to the inside of Truex through turns three and four, but he was unable to clear him. A lap later, Derrick Cope was a moving chicane for the leaders. Within a handful of laps Larson erased his deficit, making it a three lap race for the lead. He made mince meat of Harvick and then, on lap-159 he blew by Truex to retake the lead. Green flag pit stops began when Joey Logano came to pit road on lap-163. Truex’ came to pit road as well but his crew had an uncontrolled tire during the pitstop so the team was assessed a penalty, mandating he make a pass down pit road. Eight drivers opted to stay on the track, even though their lap times would be around three seconds slower than those who pitted for fresh Goodyears. Joey Logano, Keselowski, Elliott, Jones, Kurt Busch, Kyle Busch, and Bowyer made it back onto the lead lap before the conclusion of the second stage. Once again Dillon was at the tail end of the lead lap coming to the white flag, but in a three-wide, photo finish, Larson passed Dillon to put him a lap down. Larson was perhaps being a tad vindictive for Dillon’s racing in the first stage. Over the radio he said, “I hope I lapped the 3 car, that’s what he gets for running into me earlier.” But what the pass really did was take away the free pass from Truex, leaving him a lap down in 16th. Just like the first and second stages, Larson led to begin the final stage. Elliott was his closest competition but after about a dozen laps he was two seconds behind. Over the next 15 laps Elliott would maintain his gap and, in spurts, close in on Larson. He didn’t have anything for the leader though. As the stint ran longer he begin to fall farther behind. Kevin Harvick short pitted on lap-244, hoping to gain an advantage on fresher tires. Not long after a gaggle of drivers came to their crews for tires and fuel. Just like in the second stage, Larson stayed out, knowing if a caution came out he could trap competitive cars a lap down. Still running a lap down, Truex pitted on lap-253 – this time he’s team didn’t accrue a penalty. When Larson finally came in for fresh rubber on lap-259, the rest of the lead lap cars followed suite. Logano assumed the lead on lap 260 but he was scuttled out of the lead on lap-279 when Larson caught back up. For the fourth time in his career Larson led over 200-laps in a race; however, the first three times didn’t yield the California born driver a win. With 80-laps to go Logano returned to pit road for four tires and fuel. Before pitting he was the highest running of those who’d short pitted. After pitting he was a lap down with nine cars between him and the leader. A major accident between Clint Bowyer and Ryan Newman took place on lap-312. Newman was slowing down in turn three to come to pit road but Bowyer had no way of knowing. Bowyer clobbered Newman’s rear, sending them both into the wall. Bowyer gave the turn-four wall a major shunt, totaling his car in the process. 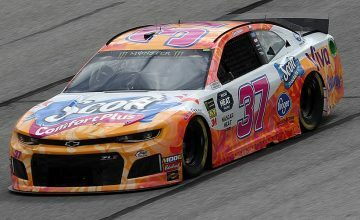 Newman had signaled he was planning on pitting by poking his hand out of the side window going down the backstretch, but a lapped car between him and Bowyer didn’t allow that message to be communicated clearly. Bowyer said, “I didn’t see him wave, but, like I said, when you come off of two and you pass 37 lapped cars and you get your bearings and everything else – maybe he waved, maybe he didn’t – I didn’t see it. Larson was only a short distance behind when the calamity broke out. He ducked under the wrecking drivers, keeping his No.42 DC Solar Chevrolet clean and pristine. 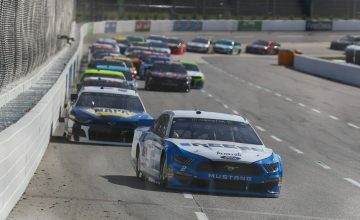 Because he had yet to pit again, and so many others had played the strategy game, only two other drivers remained on the lead lap — Keselowski and Logano. Harvick, Elliott, Jones, Kyle Busch, and Hamlin took the wave around when the leaders pitted under the caution to return to the lead lap. The race restarted with 45-laps to go. Kyle Larson bolted to the lead once again but on lap-328 a caution came out for a piece of metal sitting on the track in the exit of turn-two. It’s believed the piece of debris came from William Byron’s No.24 AXALTA Chevrolet. This caution was a major break to all of those who’d taken the wave around under the previous yellow. Like he had all night long, Larson cleared the second place driver for the lead on the restart. Keselowski stayed with him for a few laps, but before long he was a full second behind. A handful of laps later, Jeffrey Earnhardt spun out in turn-two. He whipped across the track perpendicular to traffic, stopping in the middle of the groove. Truex brushed his car against the SAFER barrier to avoid Earnhardt. He was lucky Earnhardt had slid down, out of the groove quick enough; his luck continued when he was awarded the free pass under the ensuing caution period. Keselowski passed Larson for the lead on pit road with a quick pit stop and on the restart he immediately cleared him to take command of the lead. After four laps Larson lost another position to Logano, soon after he was working hard to hold Harvick at bay.